The road comes to a halt when it hits the Darién. The Darién is covered with rain forest so thick the great Pan-American Highway, stretching 16,000 miles all the way from Alaska to Argentina, still hasn't broken through. The Darién Gap is notorious for its guerrillas and drug traffickers. Foolhardy tourists who venture in are likely to end up with a ransom on their head, kidnapping being a lucrative sideline for the FARC. Cyclists have made it through. Ian Hibel managed the feat way back in the 70s--check out the video for a taste of what he endured. 'Cycling' the Darén Gap boiled down to bashing his way through a swamp. At least there wasn't the FARC to contend with back then. 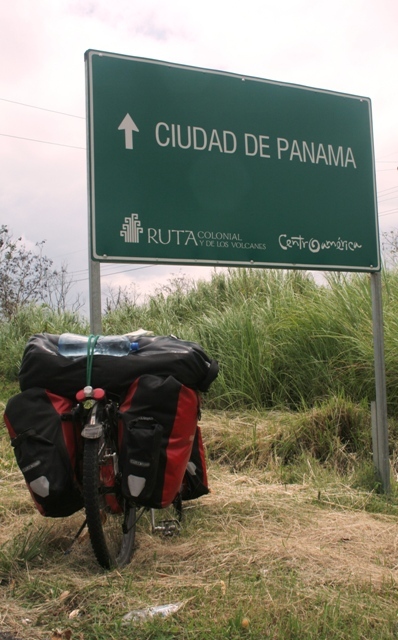 Crossing the Darién Gap by bike is possible. But not something a predominately sane person would consider. Most cyclists on their way to Colombia hitch a ride on a boat. That's the adventurous way to cross continents. You fork over around $400 to a sea captain for a cramped cabin on a rickety ship, spend four days on the high seas, visit the San Blas Islands (or Kuna Ayala as they're now known ). Travelers rave about the picture-perfect Caribbean islands populated by the indigenous Kuna. For a couple of bucks, the locals will pose in their traditional garb and tourists take home pictures of exotic -looking people sporting colorful beads and hand-woven textiles. Cheapskates fly to Colombia. Less than half the price of the boat ride, flying between Panama City and Cartegena takes just 1 hour and 20 minutes. Plus you get the free peanuts and coke. Being the ultimate budget travelers that we are, naturally we' re flying. Plus, there's the fact that I personally find picture-perfect islands about as interesting as suburban strip malls. And I'm prone to sea-sickness. Or maybe it's just that I like to find my own adventure without it being bundled up in a tidy package tour. Or maybe I'm just all adventured-out. Anyway, we´re flying. So what about the rest of Central America? From Nicaragua we pedaled further south into Costa Rica. Great place for eco-tourism, mildly interesting for cross-continental cyclists. Costa Rica's done wonders exploiting it's tranquil cloud forests and sun-kissed beaches, pristine nature and remote mountain treks. It's just that when you're on a bike there's a lot of pedal pumping involved to get to all of these cool places. And Costs Rica is a country built on tourism meaning you've got to shell out some cold hard cash to wallow in all that pristine beauty. Fortunately, way back in 2001 in our former lives as free-spending backpackers, we checked out all the sights. This time we just sped through Costa Rica on the busy (but beautiful, really stunning in some parts) coastal highway. Then it was on to Panama. Blaring music, street vendors, a few local drunks weaving around on a Sunday afternoon. Motorists honking and waving, kids shouting out greetings. Alive in a way that made you want to join in the fun. We're wandering around the small town of La Concepcion, trying to figure out where we'll sleep for the night. A non-descript middle aged guy starts chatting with us and eventually invites us to his home. We pull up in front of a concrete block house, the typical dwelling of those who are not really desperately poor, but still struggling to get by. We set up camp inside and then Pablo dives into a discussion on religion. 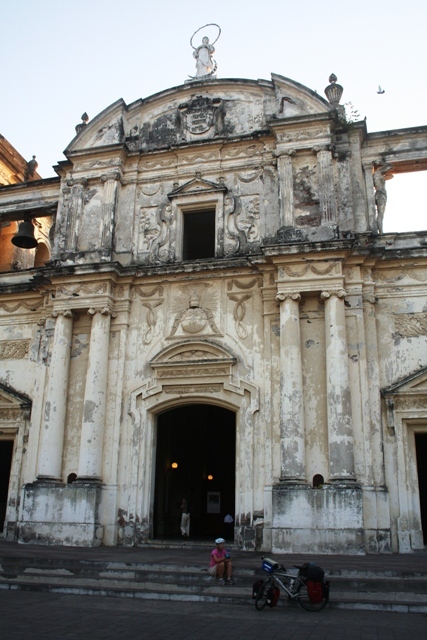 It's a hot topic in this part of the world, mainly because the Catholic Church has been losing ground to all the new evangelical faiths that promise salvation and deliverance from poverty. Pablo is a spiritual man with visions. He once received a message from God that he would travel the world spreading his version of spirituality. Pablo's been wondering now for years why he hasn't made in further than the capital of his own country. Our arrival signaled an epiphany. Now he understands more clearly God's message. It was not he, Pablo, who would travel. Foreigners, like us, from all parts of the world would be drawn to visit his small provincial town for enlightenment. Our visit was just the tip of the iceberg. Soon, he was certain, others--Europeans, Americans, maybe even Africans-- would be streaming into La Concepcion. That's what we love about the road. Meeting all the slightly wacky individuals that we seem to attract. Now it's time for a trip to one of the greatest engineering feats of the 20th century--the Panama Canal, of course. Then we'll be packing our bags and pedaling off to Tocumen Airport for a rather un-adventurous flight to Colombia. Or maybe I´ll take another look at Ian's video and reconsider overlanding it through the Darién.